PPilgrim's Pride Corporation is a Brazilian-owned, multi-national food company, currently the largest chicken producer in the United States and Puerto Rico and the second-largest chicken producer in Mexico. 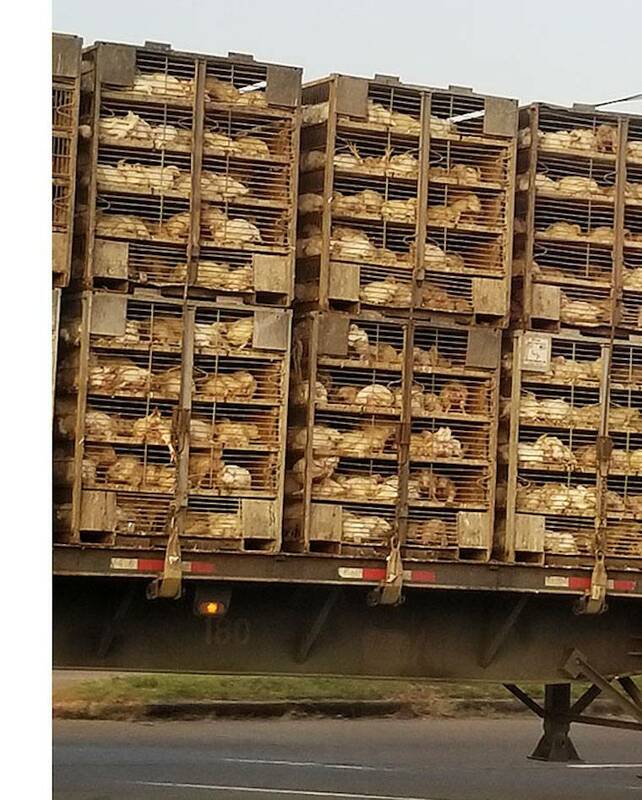 Ten to twelve chickens each weighing four or more pounds are jammed into cages on the transport trucks taking them to slaughter. Each truckload carries 3000 or more birds. Many die in the trucks awaiting the trip following the terror and injury of catching. Others die on the way and on the loading docks at the slaughter plants. Causes of death during transport include heart failure, heat stress, freezing, injuries, and terror. Dead-on-arrival birds are commonplace throughout the poultry industry. Death during transport is so common that the causes have been studied in laboratory simulations for decades, but even if solutions could be implemented, the birds’ need for food, water and rest could not be met. “Rest” would not be restful and would merely prolong the journey, and there is no way to provide food and water to thousands of birds caged and stacked on a flatbed truck. Regardless, the traumatized birds could not eat or drink under these conditions. 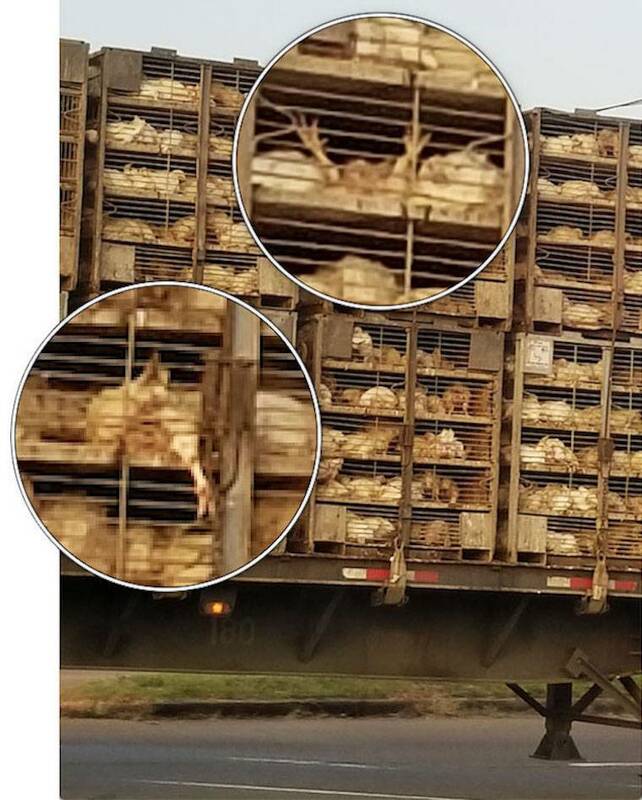 In addition, food and water are intentionally taken away from chickens slaughtered for meat several hours or more before catching to reduce the splatter of intestinal contents at the slaughterhouse. All of their food is taken away from egg-industry hens several days before catching to save the cost of feeding hens with no further economic value. There are no federal laws in the United States regulating poultry transport. The Animal Welfare Act excludes transportation of animals used for food and fiber, and the Twenty-Eight Hour Law of 1877, requiring animals in interstate transport to be given food, water, and rest every 28 hours, excludes animals, including birds raised in the same state as the slaughter plants they are going to. The Twenty-Eight Hour Law carries a pittance penalty of $500 maximum and isn’t enforced anyway. If you haven’t already done so, please remove birds and all animal products from your diet and share this post with others. Remember that what you are seeing in these images goes on every day and night 24/7 for one reason only: customers. Please let your table be animal-free. For animal-free recipes visit UPC Online Recipes. Contact Pilgrim’s Pride and urge the company to require their catching crews to place the birds gently in the transport crates and make sure they are sitting upright and not thrown on their backs or with body parts trapped in cage doors or between wires. RRequest a reply to your concerns: What are they going to do about it?